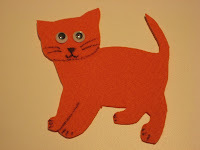 So you want to make a felt story but you're not sure how to get started? I didn't know how either until I recently got a tutorial from J, the felt story expert in my department. There are probably different techniques (and you can even buy them), but I wanted to share how we make our felt stories. Step 1: Pick a story. Think about what images you will need to tell the story. Is it a story that you can learn and tell without the book? Two books we have turned into felt stories are Bark, George (mother dog, George, cat, duck, pig, cow) and Dog's Colorful Day (dog and a bunch of colored dots). Step 2: Photocopy pictures for your pattern. 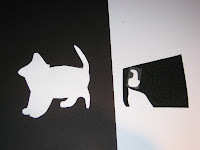 The best pictures have a clear enough shape that you can mostly tell what it is from the outline. You might have to find pictures from other books or draw something freehand if you don't find a clear picture in your book. 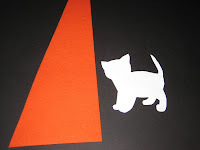 There are also books of felt patterns. Check your local library. 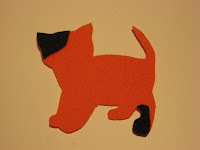 Step 3: Cut out your pattern pieces and select your felt. Remember that the pictures and colors do not have to be exactly like the book. Also remember to think about what color your felt board is. You want to pick colors that will stand out against your background. 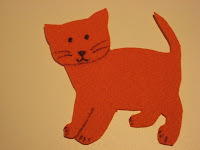 As an example I've cut out a kitten-shaped pattern and I chose orange felt. Step 4: Tape your pattern pieces to the felt you want to use. 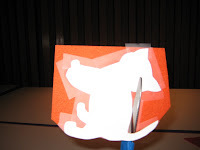 You can also trace around the pieces with a marker, but the tape will hold the piece in place, stiffen the felt for cutting, and it comes off the felt clean without leaving a mark. Cut around the pattern piece. Step 6: Add details to pieces. You can use a permanent marker or fabric paint. You can add google eyes, feathers, bits of cloth, yarn, sequins... keep it simple or make it elaborate. Step 7 (optional): Write a script for your felt. It's possible that your book might not always be around. And some stories might not need all the details that are in the book. Think about what someone unfamiliar with the story would need to know to tell the story. Are there particular phrases that are important or repeated? Include instructions for how to place felt pieces so that anyone could pick up your script and tell the story. So now you know how to make a felt story! Or maybe you already knew... so who's got some felt-story-making tips for me?? Do you make yours a different way? ETA (9/17): Ooh, you'll also want to check out Lisa's post about making magnetic board stories! What a great post! I admit to being pretty intimidated by making flannels from felt. You break it down into very manageable steps! I just posted a response on my blog. Oh I love this. 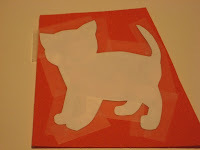 I am going to mention it on my blog at http://www.fun-activities-for-kids.com I already have instructions there for making the felt board itself but none for making your own figures. I love your explanation and all the pictures! !